Should a candidate be able to take the Uniform CPA Examination when he or she has 120 hours of education and then wait until 150 hours are obtained to be licensed? NASBA’s study of that question will be discussed by NASBA Vice Chair Billy Atkinson at the February 8, 2009 meeting of the Federation of Schools of Accountancy and the Accounting Program Leadership Group, which will bring together approximately 250 leaders of accounting schools from across the nation. Mr. Atkinson, past chair of the NASBA Education Committee, has been working to strengthen NASBA’s relationships with the educational community over the past several months. In July he met with American Accounting Association leaders to plan a “summit.” Then on October 14, 2008, Mr. Atkinson, NASBA Chair Tom Sadler, President Costello, 2008?09 Education Committee Chair Melanie Thompson and Chief Relations Officer Alfonzo Alexander met with the American Accounting Association’s Executive Director Tracey Sutherland, President Susan Haka, President?Elect Nancy Bagranoff, and Past President Jane Mutchler; plus AACSB Executive Vice President Jerry E. Trapnell; and the AICPA ‘s Chair?Elect Bob Harris and Director of Academic and Career Development Dennis Reigle. Their discussion covered: the shortage of accounting Ph.D.s, comments on NASBA’s 120/150 draft paper, ACAP’s recommendations, IFRS and implementation of UAA Model Rules. The summit was a very productive meeting, Mr. Atkinson observed, and he suggested that a similar leadership summit should be scheduled at least once a year. One of the group’s goals will be holding an education conference open to all stakeholders from the education, professional and regulatory groups. The NASBA 120/150 paper is a document developed to stimulate discussion, Mr. Atkinson said. 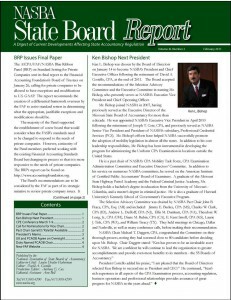 Comments received on the paper are being posted on NASBA’s Web site www.nasba.org.